A solid British contingent turned out and three went home with keeper results. The third stop of the World Surf League Pro Junior series just wrapped up in Espinho, Portugal. The first two stops in Caparica and Biscarrosse were bogged down with really small and tricky conditions so it was a blessing that this Portuguese event ran with good banks and small consistent swell topped off by great head high conditions for finals day. An ever increasing British contingent took to the event with UK surfers being involved from the very first heat of the event all the way through to Ellie Turner’s 2nd place finish in the girls finals. With the relatively new Under 18 format now settled into place there’s a more regimented structure with a small pack of big hitters occupying the red jerseys as the heats progress through to finals day. Names like event winner Marco Mignot as well as Erwan Blouin, Leo Paul Etienne and Justin Becret are consistent standouts. Underneath these thoroughbreds there’s a pack of super flashy and technical micro-groms whose future looks very bright – we’re talking the Amatrian brothers, Noa Dupouy, Sam Piter, Guillermo Ribero and the impressive Afonso Antunes. So where do the Brits fit into this fresh new WSL mix? Well Round three is where all the big talent is and it’s the benchmark round of how deep the Euro talent pool is. All but three of the Brits made it at least to this round. The standout performance yet again came from Ellie Turner whose 2nd place finish solidified her position as one of Europe’s brightest prospects. A quick look at Ellie’s calendar from the last two months reveals the amount of work that goes on behind the scenes to achieve these results. 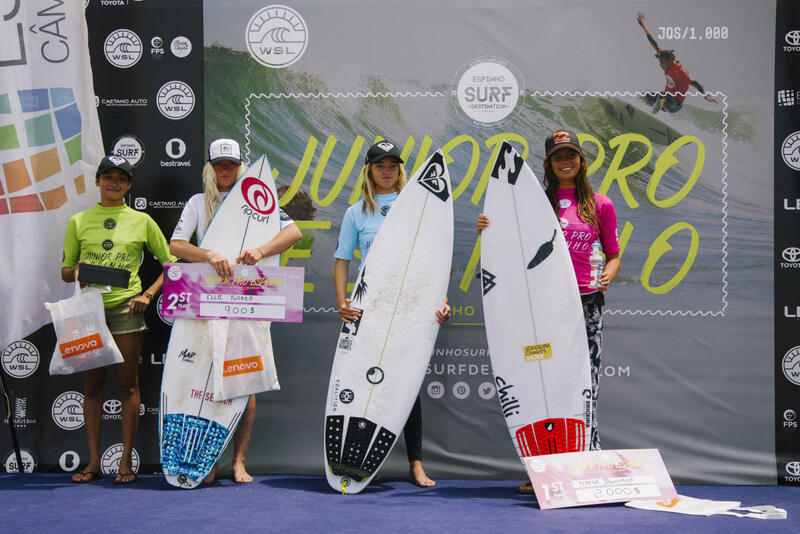 “It’s been pretty hectic.” she said “I had to leave the Biscarrosse event early and pull out to go to Brazil for the Rip Curl Grom Search International Finals. “That was a great experience and I ended up with 2nd place. I had two UK Tour events which I won and also I won the Rip Curl Grom Search event in the UK. In between all of this I did a Rip Curl training camp at Surf Snowdonia also. It’s been a very fun and busy month with lots of surfing. It’s great for the boys to have Ellie smashing through the heats and certainly acts as real time inspiration for crew such as Stanley Norman who at 14 also had a banner event. He was the top scorer in the whole of Round two and his semi-final result was achieved through textbook flow, deep bottom turns and solid rail surfing. Liam Murray Strout almost joined Stan in the semis were it not for a crucial couple of falls. “It’s all good doing the UK contests but it’s a bit of a reality check once you start watching the heats go down towards the end of the contest.” he said. All of these and the rest of the Brits left with crucial WSL experience and a heightened awareness of what the level is, where their weaknesses are and most importantly all extremely hungry to improve not just in the next event but the coming years.